I’m thankful to be warm and dry tonight, and to have my big family gathered around the table for dinner. It’s getting to be the season for cozy holiday meals, and, as always, I aim to equip you with a bountiful table of vegetarian and vegan options. And so, while we’re on the subject of creamy vegan dips, here’s one more. This one is savory and sweet, and I served it tonight with quinoa cakes—although I can also tell you with authority that it’s quite good scooped up in pita chips. It was inspired by Alli of An Open Cookbook, who brought a so-good sweet butternut-tahini dip to a Thanksgiving Sides potluck at Allrecipes recently. (Isn’t that a great idea for a party? Sides are the best part, of course.) This version leans toward the savory side, but retains plenty of sweetness from the winter squash and a touch of maple syrup. 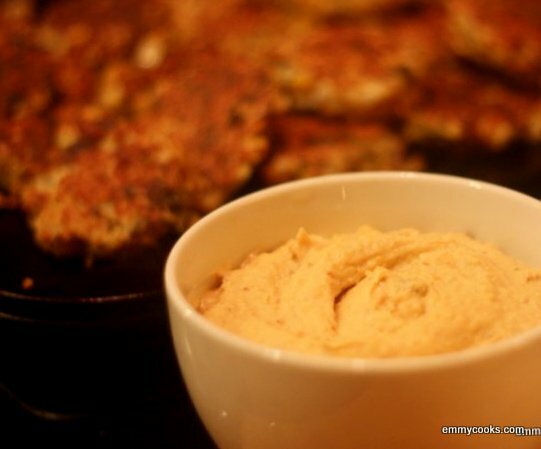 Roasted Squash and Tahini Dip or Spread: You can use any roasted squash for this recipe, but the sweetness and moisture content of winter squash can vary considerably. Taste as you go, as usual. In a food processor, combine 1 c. mashed or cubed roasted winter squash with 1/4 c. tahini, a big pinch of salt, and 1 Tbsp. maple syrup. Pulse a few times to combine. Add enough liquid (I used water, but I think almond or other non-dairy milk would be good as well, and Alli said she used Greek yogurt in hers) to achieve the pureed consistency that you desire. Taste and add more tahini, salt, or maple syrup to taste. This entry was posted in DIY, Easily Multiplies to Feed a Crowd, Emmy Cooks Original, Food, Recipes, Sauces, Snacks and Apps, Vegan or Would-Be-Just-As-Good-Vegan and tagged dip, spread, tahini, Thanksgiving recipe, vegan recipe, vegetarian recipe, winter squash on October 29, 2012 by emmycooks. Nice idea. Hope all your friends on the East Coast are OK.
Nice recipe, I love tahini. Though I’m far away from NY (I’m watching the Sandy news in BBC here in Athens-Greece) my thoughts are with the flooded NY subway, the big fire in Queens and all those people in critical condition who had to leave their hospital because of lack of electricity. May God be with you! Hi Cari! How sweet–thank you! I always like having friends with similar taste in food/cooking, that’s always the best source of delicious ideas. I hope you’ll send your kitchen faves my way! :) And I hope you’re well, nice to hear from you! Looks delicious, Emmy! Thank you for another great recipe. I will make this one today! I wish I could have made it to the Allrecipes party – sounds like it was a lot of fun! This dip sounds so good and perfect for a Thanksgiving appetizer. We’re hosting this year and have a variety of dietary restrictions with our guests, so I’m collecting yummy ideas. I’m glad to know your family is doing ok on the East coast. My brother lives in NYC and is hunkered down. Unbelievable to watch all that is happening. How fun! I checked it out and I can tell we’re going to be good cooking friends, we have such similar taste. :) I hope to see you again in person at the next cookbook club! I would have never thought of using roasted squash in a hummus-like spread/dip, but this looks fantastic! Maybe I’ll make it for my friend since she is letting me crash at her place while the city sorts out the disaster that is my neighborhood . . .
Oh, no, I’m so sorry! From afar NYC sounds like a miserable mess–and I’m sure it’s much worse if you’re living it. I wish I could send this to you! But in place of that, I’d say this recipe would easily do double duty as comfort food for you and a treat for your host. Take care and I hope things are sorted out soon. Thanks, Emmy! Like a good cook, I sent most of the contents of my fridge to a safe freezer in Brooklyn. I felt like a war mom! Can’t wait to go home. Power might be out for a week. No hot water, no cellular service downtown. Am seeking refuge in a luxury high-rise! That looks wonderful. A local restaurant here does something similar, and I love it.